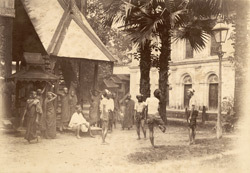 Photograph of Burmese football, taken by Watts and Skeen in the 1890s, from an album of 63 prints presented to Lady Curzon in Burma (Myanmar). This view shows a circle of four boys playing a game, watched by a group of monks. They are probably playing a type of ball game known as chinlon [or cane ball], the Burmese national game. It is played with a woven rattan ball about 12 cms in diameter and the aim is to keep the ball airborne. When it is played formally, six players stand in a circle and each must keep the ball aloft using a succession of thirty techniques and six surfaces on the foot and leg. A variation in modern Burma (Myanmar) is played with a volleyball net and only the feet and the head are allowed to touch the ball. The history of cane ball apparently dates back to ca.7th century AD and versions of it are played in most South East Asian countries.